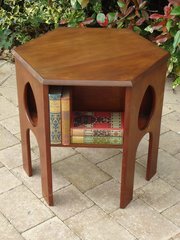 Useful and decorative Arts & Crafts hexagonal book table with cut out teardrops to three sides and book shelves to the opposite sides. Made in walnut. Offered in good condition with the top been re polished. This stands 65cms high, The top measures 60cms x 57cms. This design was retailed by both Liberty and Heals. 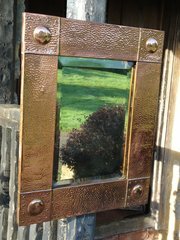 Lovely large Arts & Crafts brass trivet standing on six legs and stamped KSIA. Offered in good condition. Height 6cms. Width 63cms. Depth 21cms. 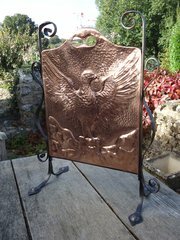 Arts & Crafts copper and wrought iron fire screen with an eagle to centre. 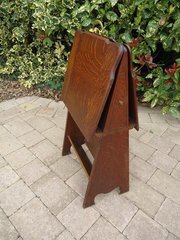 Heavy and well made metal ware and offered in a good, cleaned condition, Height 71cms. Width 57cms. Depth at feet 33cms. Good quality heavy pair of Arts & Crafts candle holders with a stylised flower to centre. Offered in excellent condition. Unknown maker. The bases are 17cms square and the distance from the edge to the handle tip is 27cms. Lovely Arts & Crafts copper coal bucket profusely decorated with stylised flowers. Good heavy and well made item offered in good condition. Height to rim without handle 31cms. The top is 39cms x 31cms. 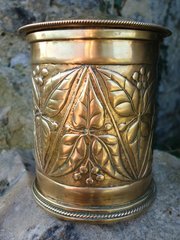 An unusual Arts & Crafts brass lidded jar most probably made for tobacco or tea as lid fits very snugly. Beautifully executed with a fine roped edge. Crude writing to base which might not be the maker as I think he would have written it neater? Offered in excellent condition and measuring 13cms in height with a diameter of 11cms. The writing reads R S Art. L F Store.1923. Good heavy quality item. 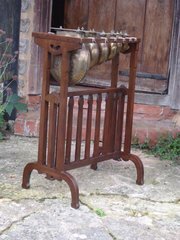 Arts & Crafts Caxton Folio or magazine stand for Liberty in Oak as illustrated in Daryl Bennett's book on Liberty furniture. The height to the top of the brass handle is 82cms. Width 43cms. Depth 27cms. Offered in good original condition, One small drawer opens as shown and the other is a dummy. 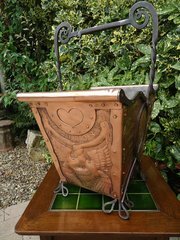 Fabulous Arts & Crafts copper coal bucket dated 1898 with long necked birds entwined to one side with the date. A design seen on many works of art by John Pearson. The opposite side has no repousee work, The front and back have stylised feathers with the wrought iron feet in the form of a birds claw. This bears no signature but his stylised birds with long necks were one of John Pearson's favourite designs Offered in excellent condition and very heavy. Height without the handle 34cms. Width 42cms. Depth 30cms. 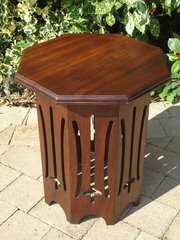 Arts & Crafts octagonal table with pierced slatted sides with spade decoration. Height 57cms. The top is 48cms x 52cms. Offered in good condition however there is one mend to base as shown. The wood appears mahogany. 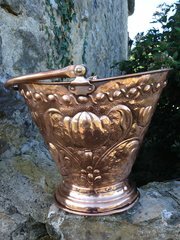 Pretty Arts & Crafts Cornish school copper candle holder attributed to J & F Pool of Hayle. This stands 10cms high and the base has a diameter of 15cms. Offered in a good cleaned condition.